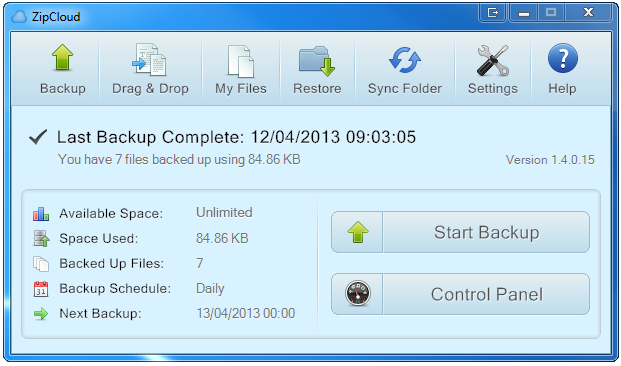 Cloud Backup Update Released for Windows Users! Here at ZipCloud, we’re very excited to announce the availability of our Windows v1.4.0.15 update which is fresh from our developer’s office! It’s of course available not only to our new cloud backup users when they sign up for a FREE account, but also our existing customers. After receiving this new update, our many users will be able to experience a number of improvements in all aspects of their desktop cloud backup control panel, meaning that elements such as upload/download speed, performance, and responsiveness can be enjoyed. One feature that may prove to be highly popular is Resumable Uploads. Imagine the situation: you’re halfway through uploading a 2 gigabyte file and then—suddenly—your internet connection cuts out. With the Resumable Uploads feature on your side, when you re-establish your connection, the file will continue uploading from the latest point prior to the interruption. To feel the benefit of this update, new users won’t have to do anything extra. When they sign up for a FREE cloud backup account, they will automatically download the new v1.4.0.15 update straight to their Windows computer or notebook. Existing users of our cloud backup service will be updated automatically.